Many people worry about the environmental effects of wood burning. The concerns fall into a couple of categories. Some have to do with the effects of harvesting trees to provide fuel. People with these concerns picture clear-cut forests. Others point out that burning wood is still burning and a source of air pollution. The fact is, done poorly wood burning can have a negative environmental impact. But done well, it can be part of an environmentally sound mix. 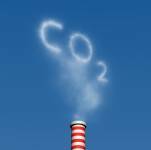 You hear a lot about carbon footprint these days, meaning how much carbon a given activity adds or subtracts from the atmosphere. The effect of burning wood is close to neutral with regards to carbon. As they grow, trees remove carbon from the atmosphere. That carbon is released into the atmosphere when we burn a log. But trees are a renewable resource. The trees growing to replace the tree we burned will reclaim the carbon from the air. Besides, we can’t avoid the carbon being released into the atmosphere. 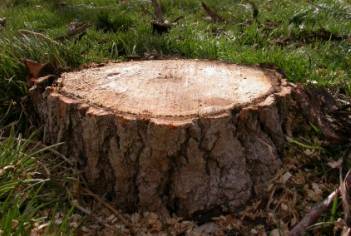 Even if the tree is left to grow old, die and rot in the forest, the carbon in it will be released as it decomposes. 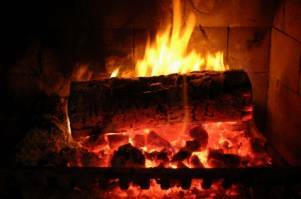 Burning in a fireplace is a rapid form of oxidation. Rotting on a forest floor is also oxidation, just slower. Because oil and gas are used to harvest the wood, the carbon footprint isn’t entirely neutral, but it’s pretty small. Particulate matter released into the atmosphere is another concern. However a contemporary, well maintained fireplace or wood stove reduces this dramatically. 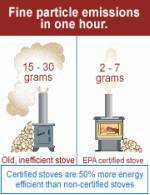 The picture at left from the EPA makes the point that a contemporary EPA-certified wood burning stove is not only more efficient in terms of heat produced, it also burns wood much more cleanly. Burning properly dried wood also minimizes the particulate output from a fire. These factors are very much under our control we can minimize the environmental effect of wood burning to a very acceptable level. The other concern people have is the effect on forests from harvesting wood to burn. While it is true that some short-sighted people might clear cut a woodlot for a quick short term profit, that’s not standard practice. Most people responsible for wood lots manage them for the long term. An actively managed forest can actually be a more vibrant and attractive ecosystem than one left alone. For example, three trees may be growing too close together for all of them to do well as mature trees. When a forester selects the weakest appearing two to harvest for firewood, the remaining tree thrives and the forest is healthier for it. The motivation for this isn’t altruistic. The remaining tree will be more valuable for lumber in the future. Not all firewood is harvested specifically to be burned. Trees taken down by maintenance crews and tree surgeons are used as firewood. Much of this would wind up in a landfill if not used as firewood. In sum, the environmental effect of wood burning depends very much on how it’s done. Sustainably harvested wood burned in modern fireplaces and stoves can be a positive addition to our energy mix. And no other way of heating your home adds as much beauty and comfort on a cold winter night as a wood burning fire.